Becoming a great blogger isn’t easy. You have to dedicate time to it and learn a completely new craft. But what can you do immediately? Here are seven easy ways to become a better blogger. 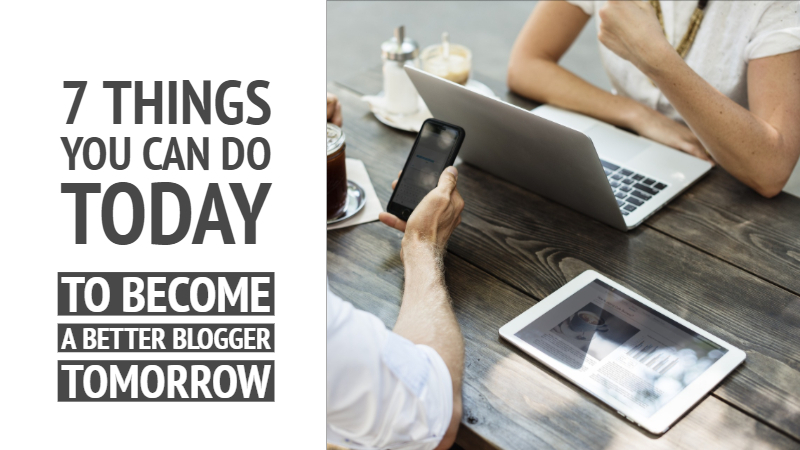 Most bloggers don’t make a living from their blogs. At least not immediately. Hopefully, you will be able to find a job that still allows you to be creative in some way. 2. Keep A Notepad With You – At All Times! Keep a physical paper notepad and a pen and pencil with you at all times. Doodle. Eavesdrop. Write it all down. Writing by hand actually makes you smarter. ‘Writing entails using the hand and fingers to form letters … the sequential finger movements activate multiple regions of the brain associated with processing and remembering information,’ says Patricia Ann Wade. (via) We spend so much of life attached to electronic devices, it seems like a good idea to keep our brains stimulated. Instead of worrying about which hashtag you should use, create your own. Use it every time you share your posts on social media. You can also use these as a call to action. When you create your own hashtag, you give potential followers a unique way to find you on social media. Never let boredom win. You have to be interested in things to be interesting. Visit an astrologer or tarot card reader or psychic. Listen to music you’ve never listened to before. Watch a film you swore you’d never watch in a genre you dislike. Learn to play a musical instrument – if you don’t. If you’re worried about your writing skills, read a book on how to write or take a writing course. Reinvent yourself. Go bungee jumping. Pick up that dreaded spider. Join a book club. At the very least, you’ll meet some interesting characters. Find somebody who blogs about the same things you do. Ask them if you can blog for them and if they would like to return the favour. You should attend conferences on the topic you’ve chosen for your blog. You can choose conferences on blogging and writing as well. Find great blogs who blog about your topic. Follow them. Use a search engine like Google and search for ‘The 10 Best Blogs On…’ You can also follow a page on Facebook and it will suggest similar pages to the one you like. Visit them and see if you enjoy the content. There are also blog directories for suggestions. This does not mean that you must write about every new thing that happens. But, when something comes along that you enjoy , or you know your followers will enjoy, write about it.